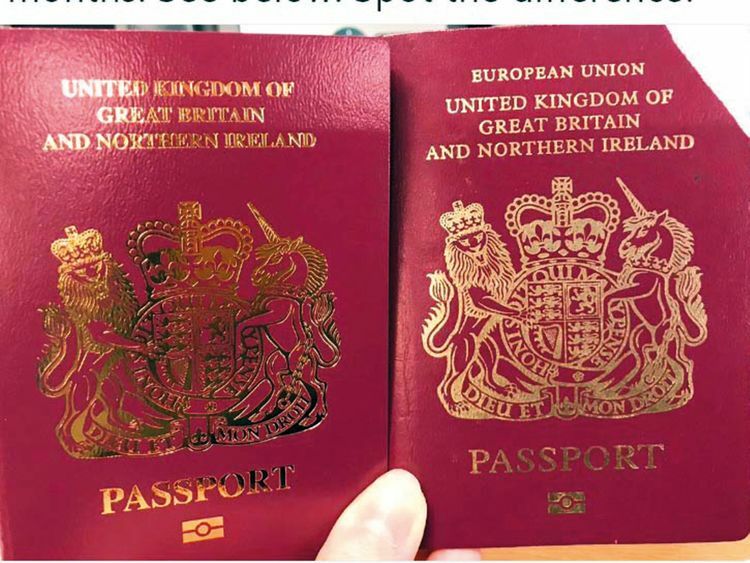 London: Britain has begun issuing passports with the words “European Union” removed from the front cover — despite Brexit being delayed and its political leaders deadlocked over how to extricate the country from the bloc. The interior ministry said Saturday that a long-standing decision to start introducing passports without reference to the EU had gone ahead from March 30, the day after the original date for Brexit. Prime Minister Theresa May has delayed leaving the bloc after 46 years of membership amid stubborn opposition in parliament to the divorce deal she finalised with European leaders in November. MPs have overwhelmingly rejected the agreement three times. Ahead of an EU summit on Wednesday, she was forced to ask them for another extension, until June 30, to prevent Britain departing with no deal at the end of next week. But with EU heads growing increasingly impatient at the political paralysis in Westminster, they could offer just a shorter postponement — or a longer period of up to a year. The other 27 members must give unanimous backing to any extension. May is trying to break the parliamentary gridlock by striking a compromise deal with the main Labour opposition. Senior ministers have spent several days negotiating with its leaders, but there were signs Friday that talks were stalling after Labour complained of no “real change or compromise”. British finance minister Philip Hammond nonetheless struck an optimistic tone at a meeting Saturday of European finance ministers in Bucharest, telling reporters there were “no red lines” in the ongoing discussions. “I expect we will reach some form of agreement,” he predicted. In an apt sign of the befuddling circumstances around Brexit, Britain’s interior ministry confirmed that some newly-issued passports now omit references to the EU atop the cover while others still bear the bloc’s name. It said the discrepancy was due to an attempt to save public money and insisted both designs would be “equally valid for travel”. “In order to use leftover stock and achieve best value for the taxpayer, passports that include the words ‘European Union’ will continue to be issued for a short period,” a spokeswoman added. Many of May’s Conservative colleagues are vociferously opposed to her outreach to Labour, while hardline Brexiteers remain implacably opposed to her deal. Hammond, who backed Remain in Britain’s 2016 referendum and is seen as favouring as soft a Brexit as possible, urged his divided party to show flexibility. “We should be open to listen to suggestions that others have made and some people in the Labour Party are making other suggestions,” he said. Labour is pushing for a much closer post-Brexit alliance with the EU that includes participation in a customs union. Labour’s home affairs spokeswoman Diane Abbott said Saturday her team must compromise. “The government perhaps has to show a little more flexibility than it seems to have done so far,” she told the BBC.